The Bauhinia is a genus that includes 250-500 species of trees, shrubs and woody vines, it a part of the larger Fabaceae (Bean or Pea) family. Most of the members of this family are found in the tropical regions of Central America, South America, Southern North America, Mexico, The West Indies, Asia, Africa, and Australia. Of them only 4 occur as naturalized in North America and 10 others are planted as ornamentals. The varieties found in North America include, Orchid Tree/Mountain Ebony (Bauhinia variegeta), Napoleon's Plume (Bauhinia monandra), Purple Orchid Tree/Butterfly Tree (Bauhinia purpurea), and White Orchid Tree (Bauhinia aculeata). Depending on what region the Bauhinia's are planted in, they can occur as either deciduous or evergreen. The leaves generally appear alternately, unifoliate, deeply notched at the tipped or Obcordate (heart shaped) and green in color. Depending on the species the color of the flowers can range from a pure white, buttery yellow, orange, light pink, deep magenta, red or purple. Flowers are 5-12 cm and all have five petals. Flowering time also varies by species. The fruits generally appear in flattened legumes that contain the seeds, the legume size varies from 13-25 cm long. The bark is gray and smooth becoming rougher with age. Most prefer acidic soils and do not tolerate salty or dry conditions well. The Grand Eucalyptus - Eucalyptus grandis is a very large evergreen tree that can reach heights of up to 180 feet tall in it's native range. The trunk is straight with a single trunk and ascending branches topped with clumps of leaves. The tree is native to Australia but has been naturalised in areas of both Central and Southern Florida. 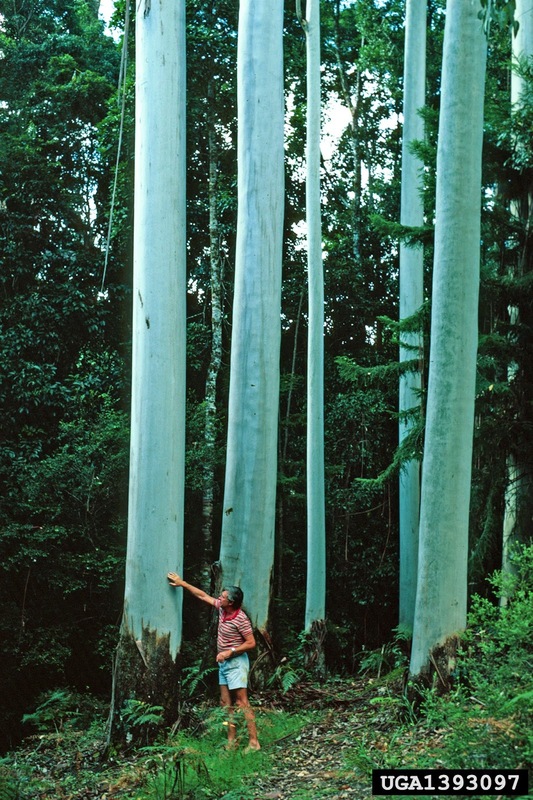 The leaves of the Grand Eucalyptus are very similar to the Swamp Mahogany (Eucalyptus robusta) and the two are sometimes mistaken for one another. 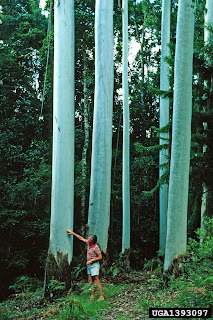 Occasionally the Grand Eucalyptus is referred to as the Rose Gum. 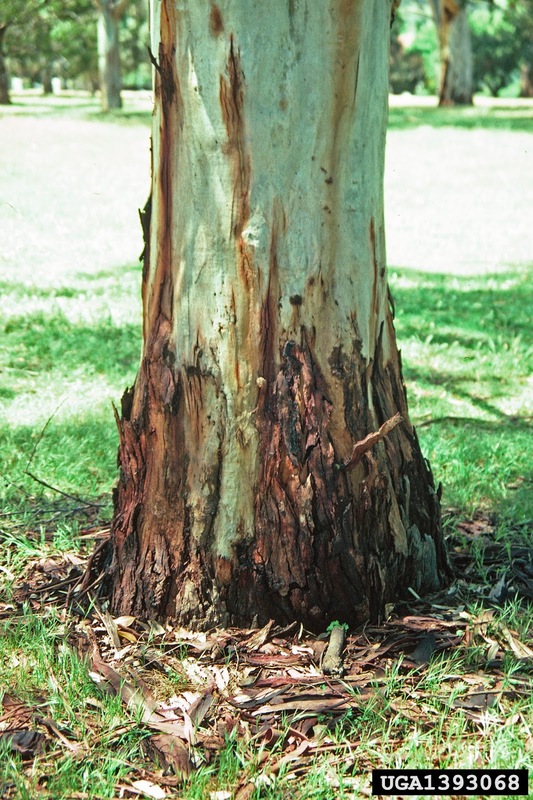 The bark of the tree is mottled and shreds to reveal a smooth white, gray or green layer below. The leaves are broadly lanceolate to ovate with either a rounded or heart shaped base. Leaf tips taper to form an elongated point. The upper leaf surface is a slightly lustrous dark green color with pale gray glandular undersides. The flowers occur in vase shaped buds that are initially covered with a pointed conical cap, this cap eventually falls off revealing a puffed mass of white stamens in the Summer. The fruit is a capsule approximately 8mm long that opens to reveal about 25 seeds each. The Jabuticabeira Tree or Brazilian Grape - Plinia cauliflora is a member of the Myraceae family and is native to Southeastern Brazil. There are many species that are closely related and within the same family that are often referred to by the same common names. 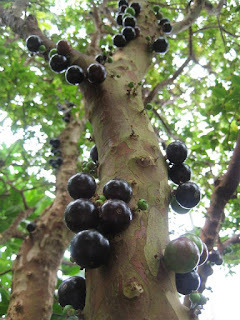 Some of the most common names include Brazilian Grape Tree, Jabotica, Jaboticaba, Guapuru, Guaperu, Guarani, Hivapuru, Yvapura, and Sabara. A slow growing evergreen that reaches 50 if left untrimmed. It prefers moist and rich soils but is highly adaptable to varying locations if well tended to. The flowers grow directly from the trunk in a cauliflorous form and are white in color. In the wild they only flower and bear fruit once or twice annually, however when regularly irrigated and grown in tropical regions it flowers frequently and can bear fruit year round. The bark of the tree is very similar to that of a Crepe Myrtle with a peeling appearence that reveals different shades/colors below. The leaves begin a salmon color when the tree is young, changing to green with age. Image Citation: Adamantiaf [Public domain], via Wikimedia Commons. This species is grown primarily for the fruit which is purple to black thick fleshed berry with white pulp. The fruit is generally 3-4 cm in diameter with 1-4 embedded inside. The fruits can be eaten raw or used to make jams, jellies, tarts, desserts, wines and juices. 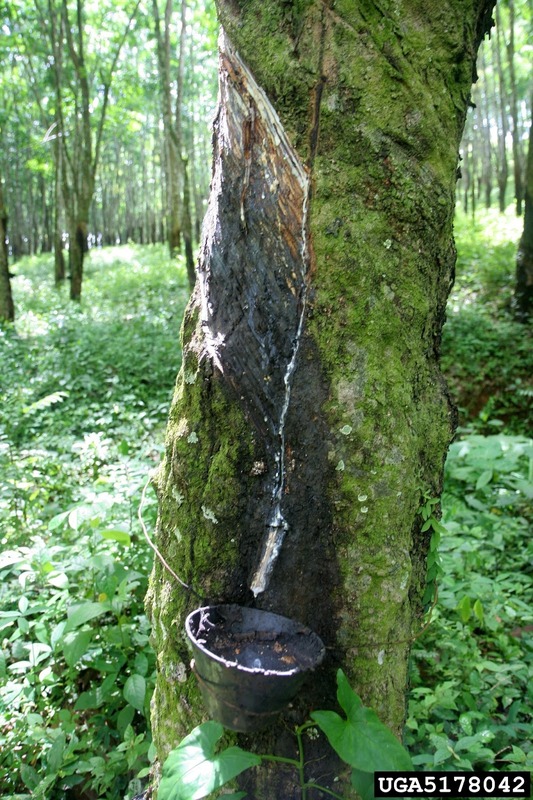 The fruit has a very short shelf life and can begin to ferment within just a few days of being removed from the tree, hence the common use in jellies and wine making. Traditional Brazilian medicine has long included the use of the sun dried skins in the treatment of hemoptysis, asthma, diarrhea, and inflammation of the tonsils, an astringent compound is made from the skins and gargled or ingested. Research has also found the presence of antioxidant, anti-inflammatory and anti-cancer compounds within the fruit, the most notable is Jaboticabin. The Silk Floss Tree (Ceiba speciosa or Chorisia speciosa ) is a beautiful tree that seems to grab attention year round. At one time this tree had it's own Genus (Chorisia) hence the secondary name that it is often still sold under today, but has since been reclassified within that original genus. The tree is native to tropical and subtropical areas of South America such as Argentina, Bolivia, Paraguay, Uruguay and southern Brazil. It is a member of the Bombacaceae family, the same family as the Baobab, Kapok and Ceiba Chodatii. It is often confused with and referred to by the same common names as the similar Ceiba chodatii. Silk floss trees grow in quick spurts when there is abundant amounts of water available, in moist growing conditions the tree can reaches heights of 82 feet. Even with the potential for large growth the Silk floss tree is most commonly used for ornamental purposes, it is also used as a street tree in subtropical areas such as South Africa, Australia, Northern New Zealand and the Southern United States. Recommended for hardiness zones 12-24, they are best suited for warm often dryer climates similar to Southern California. It is resistant to drought and can also tolerate moderate cold. When young the bark of the tree is quite green, this is due to the high chlorophyll content. The high chlorophyll content allows the tree to continue the process of photosynthesis when the leaves are absent. As the tree ages the bark darkens to a more gray color with various sized thorns covering the majority of the trunk area. The trunk of the tree is shaped much like a bottle, with the lower 1/3 of the tree have a bulging appearance. The branches generally grow in a horizontal fashion and are also covered with prickly thorns. The green palmate leaves are made up of five to seven elongated leaflets. The flowers are creamy white in the center and a bold/bright pink on the remaining portions of their five petals. They measure 4 to 6 inches in diameter and their shape is often compared to that of a hibiscus flower. The nectar attracts various insects including monarch butterflies, which aid in the pollination process. The flowers are in bloom between February and May (in the native regions of the Southern Hemisphere), but can also bloom at other times of the year depending on the location of the planting. The flowers of the often compared and related Ceiba chodatii are similar appearance, but their coloring is creamy white in the centers and yellow on the remaining portions of the petals. The fruits appears in lignous ovoid pods, approximately 8 in long. Each fruit/pod contains bean-sized black seeds surrounded by a mass of fibrous, fluffy matter often compared to cotton or spun silk. It is possible to extract small amounts of vegetable oils (edible) from the seeds and the fibrous material can be used as a light stuffing or insulation material. The Chinese Wingnut - Pterocarya stenoptera is a member of the Juglandaceae family. It is native to only China and can be grown in hardiness zones 6 to 8. A deciduous tree with a rounded and broadly spreading crown, the maximum height ranges from 50-70 feet tall with a spread of 50-70 feet. The Chinese Wingnut is considered to be easy to establish, and once established it is capable of tolerating some drought and soil compaction. Mature trees have agressive, shallow and also extensive root systems. 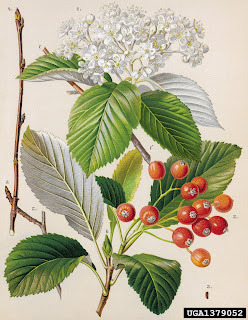 The branches freely sucker if left untouched.they prefer well drained soil and full sunlight. Generally the Chinese Wingnut is planted as a shade tree as it requires a large area to reach full potential. The agressive root system could cause damage or issues if planted too close to sidewalks, foundations or other structures. The name Chinese Wingnut comes from the unusual shape of the trees fruit. The fruit appear after the Spring flowering has occured. 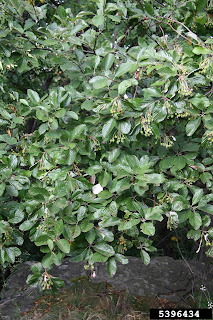 The fruit are small, green and winged nutlets, they develop in the female catkins during the early Summer. Each nutlet has two distinct wings and matures to a brown color in late Summer through early Fall, sometimes even remaining on the tree until Winter. The flowers are light green and appear in pendulous catkins. The female catkins average about 20 inches long however the male only average 7 inches long. The flowers appear between May and June each year. 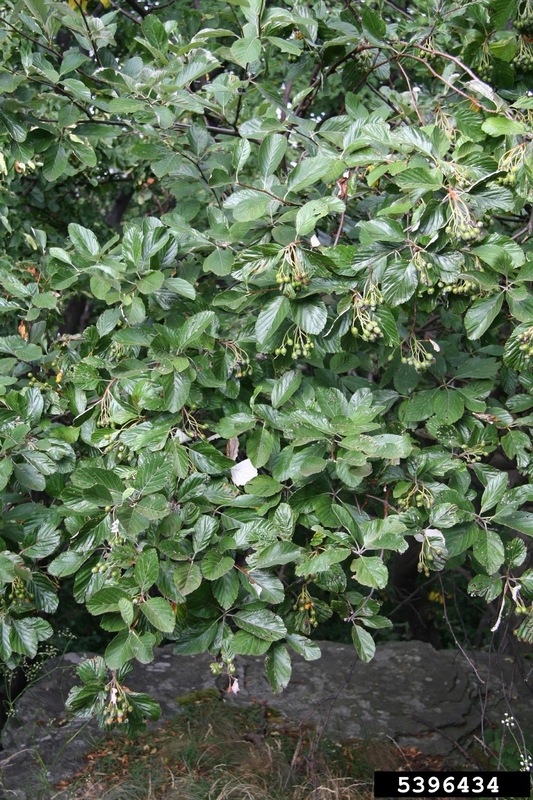 The leaves are compound and odd-pinnate, each leaf contains 11-25 shiny, elliptic-lanceolate, sharply toothed dark green leaflets 2-5 inches long. In most cases the terminal leaflet falls off making the leaves even-pinnate intead of odd-pinnate. In the fall the leaf color changes though not significantly to a more yellow-green. Also in the same family (Walnut/Juglandaceae) is the Walnuts (Juglans), Hickory (Carya) and Wingnut (Pterocarya). The genus name for the wingnuts come from the Greek words ptero which means winged and karyon meaning nut. The Chinese Wingnut is often found hybridised with the Caucasian Wingnut which is very similar in all ways except the shape of the leaves and the type of wings on the fruits.